1950's vintage mid century era earrings. Sterling silver. Minimalist rectangle with applied rectangle and open square. 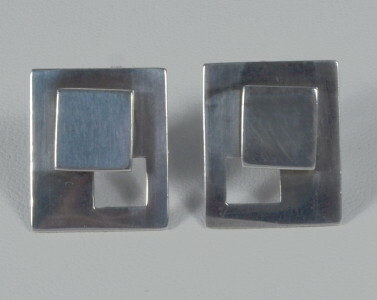 Marked STERLING earrings backs and on screw back. All original mid century era, true 1950's vintage. Very good condition. Solder repair at screw back on one... a bit messy but secure and not seen when wearing.